Medea goes to Jason, newly awoken from his marriage bed (albeit surprisingly clothed). She’s going home but leaves Jason with a belated excuse (I don’t want to be evil like auntie despite never showing any problem before! ), some knowledge (Pasiphae, on the winter solstice, is going to a special temple where only god touch can enter) and something to get rid of her magic (despite the fact Jason very easily nearly killed her before except for his mummy issues. Is it a potion of Mummy Issues Banishment?). She tries to claim affection between them and he tells her of his new marriage. Medea leaves and Jason tries to convince everyone that trusting Medea is a super good idea, because if the sworn enemy who hasn’t tried to kill you several times can’t be trusted, who can? No-one else is a fan of this plan. Jason isn’t a fan of basic common sense. Hercules also notices Pythagoras is having issues about Icarus and tries to draw Pythagoras out – implying he thinks Pythagoras is in love. Goran doesn’t want Pasiphae to go to Hecate’s temple but she doesn’t think she really has much choice in the matter. To the temple (which could be a lot smaller. I mean only the god-touched can enter – how many of them can there even be?). Pasiphae drinks from the water that Jason has already tainted with his potion and Jason confronts her. When she tries to use her nifty magic, it fails. In the name of the gods they let her pray first (please don’t let the witch chant, please don’t do this). Hercules finally stabs her! It’s dramatic, well acted and about damn time. Pasiphae is dead. Um… not to be callous to the drama but would someone mind awfully beheading her and burning the body? Pythagoras nominates Icarus – who he realises must be a traitor. Pythagoras meets with Icarus and they talk (after a brief moment when it looks like Pythagoras may stab him). Pythagoras confirms that Pasiphae is dead and that Jason intends to offer a totally-genuine-honest-and-not-a-trap peace deal to Cilix. Tearfully, Pythagoras tells Jason they’ve laid their trap. Icarus passes everything to Goran and Cilix – and Goran is honourable enough he actually agrees to release Daedalus. Goran, being so honourable (and naive) is super-duper shocked that Cilix intends to become king and plans to ambush them at the peace meeting as well. Of course, Daedalus is not exactly happy with his traitor son. Jason does. And then so does Goran. Is it Ariadne’s turn next? Amusingly, seconds after stabbing Cilix, Goran says he’s seen too many men die (did you just close your eyes? Though it’s true, Jason & co kill a dozen guards every week). Goran and the army support King Jason – in exchange for no punishment against his men. Jason agrees. Now he just needs the gods’ blessings. Jason does have a brief moment of not trusting Goran – but this is the man who trusted Medea so that doesn’t last. Back to Atlantis where Melas offers a very late and very lacking apology. That said, everyone swears loyalty and is duly forgiven. The blessing will go ahead, everyone will completely forget the whole blasphemy, oracle killing thing because it’s not longer useful to the plot. Ariadne and Jason are all couply but she’s all doubtful because of what Pasiphae said – presumably about Medea. Nooooo do not do this. No-one can be this damn stupid? Hercules sets to drinking while Pythagoras goes to find Icarus and tell him the good news in a broken monotone. They confront Icarus’s betrayal and how Pythagoras used it. Pythagoras points out the lives Icarus was throwing away, including his own – adding that “I mean nothing to you,” getting the dramatic” you mean everything to me”. Which, along with their tearful reactions, takes them beyond friends – especially when Icarus tries to kiss him. Pythagoras says he understands, but will never forgive him – and leaves. Alas Ariadne does believe him – and confides in Hercules that she thinks Jason did sleep with Medea and has the woo-woo bond and she’s all tearful and sad and needs her head dunking in a pond until she comes to her senses. Of course one of Medea’s dragon/bird things retrieves Pasiphae’s corpse. Aaaaargh I told you! Burn the body! Damn it! She’s brought back to the Temple of Hecate – and blinks. Which could just be terrible camera work, I admit. The dragon bird returns to the city with Pasiphae – now very much alive – who demands Goran’s obedience. Goran refuses – and she kills him with magic. The soldiers’ very quickly changing loyalty swings back again. Who manage to swing the guards as well. Worst Royal Guards Ever. Jason and Ariadne go for the blessing of the gods and as Oracle 2 chants, Pasiphae’s guards attack, killing her loyalists and charging into the temple. Yes the same people who staged a coup over blasphemy just invaded a temple. At least Melos is pissed by this and Pasiphae and he decide to have a stare off (rather than her use magic to help her men). She stabs Melos who tells Oracle 2 to run – which means Jason et al are on the run again. Y’know this wrath of the gods everyone is afraid of doesn’t seem to do a whole lot – but nor does their fear really. Pasiphae is back in command because of course she is. Honestly the politics of this city is bizarre and simplistic. Naturally she wants Jason & co found and stabbed and they’ve gone to hide because, after 2 seasons to the contrary, we’re now pretending Atlantis’s walls are difficult to get past. Faced with death, Ariadne, of course, needs to ask about Jason and Medea. Jason reassures her. I get friction burns on my rolling eyeballs. The city is, again, torn into chaos and Icarus decides he has to go help Pythagoras. Daedalus decides to help him. Using wings – which, I guess, is true to legend (and, honestly, I have to give maximum points to “don’t fly close to the sun, the wax will melt.” “it’s night time”. That mused me) but not especially useful in the circumstances unless the wings come with bombs. Oh, it does. Ok I take it back. He bombs the guards trying to break into the house where they’re hiding (and bombs most of the rest of the guards around Atlantis. Y’know if Jason does retake this city their near neighbours will easily invade). Icarus is shot down and Pythagoras runs to him. Icarus is still alive and Pythagoras kisses him before they flee out into the forest where Oracle #2 tells them they can defeat Pasiphae by destroying the source of her power – they need to find the Golden Fleece in Kolkis, helped by Medea. No-one is a fan of this plan. Ariadne insists on coming with. And the oracle has a vision of the ship, the Argo, Medea and Jason. This was achieved by both torturing the plot through a series of non-sensical events and the characters reacting with the combined intelligence of algae. Ariadne may take the prize for the utter inept attempt to keep her throne in the face of a completely nonsensical, weak plot. But Melas, Jason, the Oracle and just about everyone else all compete to be more ludicrous so the plot can actually work – because it’s the only way it can. Ariadne can only be pushed out of the city by having the intelligence of cottage cheese. Melas can only be manipulated as easily as he is because the incense in those temples clearly has some side effects. The same applies to the setting - the army is almost ludicrously easily co-opted. Blasphemy is either completely ignored one moment and powerful enough to topple a queen the next. Pasiphae goes from being helpless before Jason’s sword one moment and able to break necks with a word the next. Goran’s moral development is just a flat line of obedience to suddenly finding some moral outrage from somewhere. This applies to Jason as well – he went evil for two episodes. For reasons. Irrelevant reasons because it didn’t last long enough to have any real impact on his character. This whole “touched by the gods” thing is sorely lacking in anything approaching development – it’s become a grand, magical fixit for whatever plot shenanigans the writers want to have. Jason and Medea together? God touched. Pasiphae alone? God touched. Jason going evil? God touched. Speaking of underused women – Medusa. Medusa was an awesome conflicted character who really sold her conflict. She was a strong, determined woman who tried her best and boke but tried to make it right. We needed more of her, more of her conflict and her struggle – more to give her sacrifice meaning. Her sacrifice itself wasn’t an inherently bad thing because of the whole epic tragedy of the character – but she needed more than that and there needed to be more coming from it – her sacrificing herself for the city, to save the people would have been epic. Her sacrificing herself, ultimately, for a single person jailbreak is considerably less so. Some actual development of female characters would have gone a long way to making Medea make sense. Because actually revealing Pythagoras is gay or bi waited until half way through the very last episode of the very last season. This is something we’ve seen before – a show will go on without much more than a hint (if that) that LGBT characters exist – then a brief moment just before the end of the season (or the end of the entire show even) we will have a the belated, dramatic revelation that a main character is LGBT! Rejoice, inclusion – and cancelled. Witches of East End, Bedlam, Sanctuary all played the same game – throw in their LGBT inclusion at the very last moment when there was both absolutely no time left to develop that into actual characterisation or storylines. It’s an afterthought – almost a retcon and it’s a particularly crafty form of limited inclusion. After all, you can claim that a major character – even a protagonist – was LGBT! Isn’t that awesome inclusion? But that inclusion is only revealed – only portrayed – in brief seconds before the show ends; it’s adding seasoning to the plate after you’ve almost finished the meal. 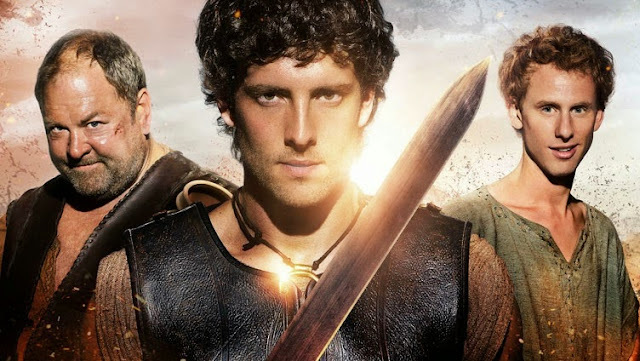 The contrast is quite clear in Atlantis when we examine the three main characters and their romance: Jason and Hercules’s romances have completely defined the series. Jason and Ariadne is the backbone of the entire show (quickly replacing finding out about his father). Hercules’s utterly tragic relationship with Medusa drives a lot of storylines, is powerful, maintained and ends up being one of the major elements and driving forces and sources of conflict in the second season. Pythagoras and Icarus? Icarus isn’t even introduced until episode 9 of the second season and either of them being attracted to men, let alone an actual romance, doesn’t appear until the very last episode – well over half way through at that (that kiss was less than 10 minutes before the episode ended).